Ann completed a Bachelor of Medical Science at the University of Wollongong in 2006. In 2007 she undertook an Honours project at the University of Canberra, whilst completing an apprenticeship in fitness. Background: Concussion is an injury that is associated with many sports, in particular ice hockey, martial arts and the various codes of football. 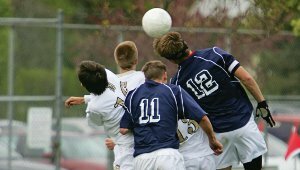 Concussion alters the stability of a person and as stability is vital when playing sports, the consequences of undiagnosed and untreated concussions are enormous. Aim: To look at various methods used to assess posture and stability in athletes, and their use in making safe return to play decisions after a sport-induced concussion. Methods: A search was conducted through PubMed, using the terms ‘concussion’ and ‘sport.’ Article titles were initially screened by the author and if the title seemed to be relevant to the purpose of the review, the abstract of the article was then screened for relevance. Results: Concussion negatively impacts upon an athlete’s cognitive and motor functioning. Cognitive testing has previously been assessed and is currently used; however it has been shown that cognitive function may return before motor functioning. The time taken to recover the motor component is usually between three to ten days; however, this varies considerably between athletes. Balance and gait testing are a means of objectively assessing the stability of an athlete and have proved to be particularly useful in monitoring the recovery of an athlete after suffering concussion. Conclusion: Balance and gait testing are means of objectively assessing the stability of an athlete. Although their use is applicable to many situations, they have proved to be of particular usefulness in monitoring the recovery of an athlete after suffering concussion. Through their use, the subjectivity of the assessment is being eliminated, ensuring informed and supported decision-making regarding the safe return to play.